Tiny and interesting town on the edge of the Southern Tablelands. ” the place where many waters start and divide”. The first European settlers had arrived by 1839 and other properties were taken up by graziers in the 1840s. The village began to develop in the 1850s around an intersection of tracks. The Nimmitabel Inn was established here in 1854. A police station was in existence by 1855 and the village was proclaimed in 1858. A post office opened that year and town allotments went on sale. By 1859 there was a store, a private school and a second hotel. The village picked up traffic bound for Kiandra in the 1860s and it began to expand (it was once more populous and important than today). A courthouse, watch house, flour mill, bank,. provisional school and two churches soon appeared. A butter factory was built when dairying began to develop in the district towards the end of the 19th century. The railway arrived in 1912 (closed 1988) and timber-milling got under way in 1921 with the opening of the area’s first timber mill. In 1959 Nimmitabel was used as one of the locations for the filming, by Warner Brothers, of Jon Cleary’s novel The Sundowners. The town has recently received something of a restorative face-lift. The town’s old cemetery is quite historic and interesting with headstones dating back to 1842. If you are headed into Nimmitabel from the north the first building on the left is the Nimmitabel Motel. Turn left here into Stanton St then take the first left into Tom Groggin Rd. At the intersection of the highway and Bentley St is the old town well. 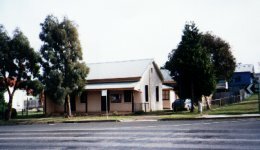 Just along the road, on the western side of the highway, in the centre of town, is the Tudor Inn which was built c.1890 as Moran’s Federal Hotel. Opposite is the old Commercial Hotel (1895), now a private residence. Nearby, at the intersection of the highway and Clarke St, is the Nimitybelle Emporium. The original buildings were erected in the 1890s. On the other side of Clarke St is Geldmacher House, built before 1870. It once housed part of the original Commercial Hotel and is now home to the Nimmitabel Heritage Centre. On the other side of the highway is the police station (1863) which consists of station, residence, detached courthouse, two stone cells and three-stall stable. Head west along Clarke St. A short distance along, on the right-hand side, a tall cylindrical tower-like structure. This old flour mill (1865-72) was built almost single-handedly by a German settler named John Geldmacher who also owned a store and other town allotments. 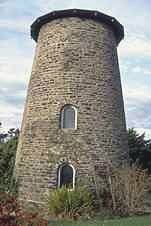 He initially fitted sails but these were not permitted so close to a road where they tended to frighten horses. Thus he used horses to drive the mill which was not a great success. It was later a timber mill and is one of two such mills left in eastern Australia. On his death Geldmacher left money for a town hospital which was used to establish the Bush Nursing Service on the site of his home, adjacent the mill. This building is now the Community Health Centre. Return along Clarke St, across the highway, and take the first left. A short distance along, to the left, is St Andrew’s Catholic Church. This was the first stone church in the Monaro. The foundation stone was laid in 1856. It was extensively renovated in 1916. Opposite is St Joseph’s Convent and School (1902) which ceased to function as a school in 1982. A little further along the road, to the right, is the public school complex, consisting of a classroom, headmaster’s residence and toilet block. They were built of random-coursed stone in 1882 with smooth stone quoins and window surrounds. There are later additions. Return to the highway and continue south. A short distance along, to the left, is the Royal Arms Guesthouse, a bed-and-breakfast with a craft section. The stone cottage may date from c.1850 and the larger section from the 1860s. The archway was used to shelter coaches. This building was once the Royal Hotel. Biggenhook (1852-1914), the last of the Ngarigo Aborigines in the Cooma area, stayed at the hotel, helping with the children of the hoteliers. 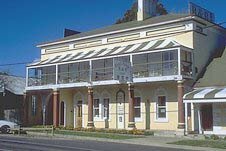 It appeared as the ‘Australia Hotel’ in the film The Sundowners.